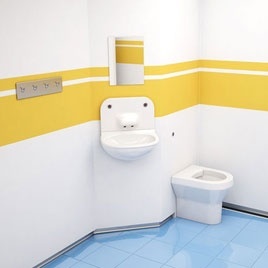 Healey & Lord Ltd have completed the supply of Titan high security washroom equipment to the Ida Darwin site operated by Cambridge & Peterborough NHS foundation Trust. The supply contract carried out between November 2011 & March 2012 involved significant quantities of anti ligature sanitary ware and washroom control systems and an open dialogue with NHS representatives and the numerous contractors on site. Whilst the Ida Darwin contract was underway a similar contract was undertaken by Healey & Lord at neighbouring West Suffolk Hospital as well as smaller satellite projects around the country.